Latest results are getting in that Putin got 63.8%. That a second round would be avoided was never really in serious doubt for the past month, nonetheless the election would still be important from several other perspectives, such as the level of falsifications (in particular, in comparison with 2011), and the relative performance of Zhirinovsky, Mironov, and Prokhorov. I’m afraid there was still substantial fraud, greater than the 2%-3% I predicted (relative to 5%-7% in the Duma elections). The FOM exit poll gave Putin 59.3% (80,000 respondents, 81 regions), the VCIOM exit poll gave him 58.3% (159,000 respondents, 63 regions). That is a 5% point discrepancy that is too big to explain by their margins of error. In particular, the results from large parts of the North Caucasus remain as hopelessly ridiculous as ever. That said, there were improvements, especially in Moscow. Putin got 48.7% there. 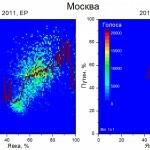 This is close to, if still higher, than the 45.1% recorded in Golos observer protocols. The Citizen Observer initiative says he got 47%. (Recall that United Russia, which always lags Putin by 10%-15%, got 46.6% in Moscow in 2011, whereas Putin got only 2% points higher; this is further, if indirect, evidence of mass falsifications in 2011). 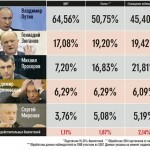 The Golos observer protocols gave Putin 54.7% nationwide. The average of observer protocols from all election monitoring organization gave Putin 50.7%, with some giving him less than 50% (one example is Navalny’s RosVybory project, which gave him a mere 49.0%). Overall, I trust the exit polls more. They are more accurate than observer protocols for sampling reasons. Exit polls try to cover the whole country, and FOM/VCIOM largely succeed. Observers are more concentrated in the more central, accessible areas, where Putin is less popular than average. Furthermore, observers in this election took special care to focus more on stations where there was evidence of fraud in 2011. As such, the effects of “bad apple” stations figure more prominently in their figures. I prefer exit polls, post-elections polls, and statistical evidence. Grainy videos on YouTube where it’s impossible to work out what is happening, photos of lines of buses or big groups of “carousels” going about stuffing for Putin, etc are next to worthless. Speaking of those carousels, note that Moscow is a city of about 12 million. 75% are eligible to vote, and there was 60% turnout. This means there were about 5 million voters on March 4, 2012. You need tens of thousands of carousel workers and hundreds of buses (50,000 people, 1,000 packed buses = 1% for Putin) just to make the slightest uptick in the figures in support of Putin who has an unchallenged lead anyway. In the courts, its been shown that whereas witness testimony is the type of evidence that is most frequently believed in by jurors, it is also the least objectively reliable. Same for these anecdotes about carousels and coerced voting. I view all evidence on these lines with great skepticism and recommend readers do the same. Prokhorov did far better, getting more than 7%, than I expected, in significant part thanks to Moscow where even beat Zyuganov with almost 20%. Far more tellingly, perhaps, he only got 6% in Norilsk, where he is well-known as the owner of the nickel combine and main employer. Perhaps too well-known. I was disappointed to see Mironov flopping, not even eking out 4%. Also a bit surprised, as I though he did very well in the TV debates. I guess most Russians disagree. Overall, Western coverage hasn’t been quite as hysterical as in 2011, though if past experience is any guide things can change quickly for the worse (best example: First day coverage of the Ossetian war was actually fairly objective, only later becoming a propaganda fest in support of Saakashvili’s aggression). FEMEN booby protest. PS. A documentary on them. Ballot stuffing in progress in Daghestan. The results at that station were annulled, but the 91% turnout and 93% Putin vote in that region indicates this was far from a isolated case. Komsomolskaya Pravda: Караул! Лови фальсификаторов! An account of how the liberals have portrayed several things as falsifications (with “video evidence”) but which in fact were nothing of the sort. E.g., supposed “ballot stuffer” in Vladivostok was testing the machines before the start of the voting as required by regulation. Georgia TV blasts Russia for fraud. Because Saakashvili is such a great democratist. On Mark Chapman’s blog, kievite calculates that US funds Russian opposition movement to tune of $500 million a year. Alex Mercouris notes that the web cams were a genial idea. The Wall Street Journalist (let me remind you, a plagiarist institution) resorts to outright, mendacious LYING to support its anti-Putin agenda: “Supporters were bused into Moscow to boost Mr. Putin’s vote in the capital, where his support has been below 20% in polls.” This is completely, utterly wrong. 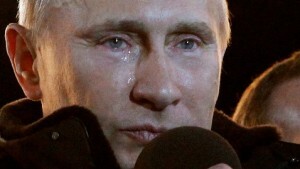 VCIOM predicted Putin 43.7% there; FOM, 45.0%. The real result was 47.0%, within the margins of error of both polls. Say one thing for the WSJ, though, they don’t censor my opinion there (unlike The Guardian). CNN: “”The point of an election is that the outcome should be uncertain. This was not the case in Russia,” said Tonino Picula, the head of an observer mission from the Organization for Security and Cooperation in Europe (OSCE).” – Erm, that’s not the point of an election at all, Mr. Picula. Eminently satisfying to see Russia Today give Luke Harding, Miriam Elder, and Shawn Walker well-deserved drubbings for their smearing, lying ways. Also courtesy of Moscow Exile I found this old post by Vadim Nikitin about Luke Harding’s plagiarism, which apparently extended well beyond riffing off the eXile and Kevin O’Flynn.